Artist Emma Olswing’s oeuvre is punctuated by hushed, cerulean blues and propulsive purples. The subjects of her art are confidently self-aware: Their bodies crane, arms occasionally akimbo, with purpose and energy. Fingers jut, sometimes reclining into an abyss of powdery teals. Identity, spatial appreciation, and the exploration of color are all present in Olswing’s work. There’s effusive melody, designed restraint, and a compass for geography. The San Francisco-based artist deconstructs and reassembles beauty with a sense of fashion, nuance and empathy. Robert Patrick: Much of your work is framed by soft colors. And though the the pastels create a discernible calm, there is also a definitive divergence in tone when strategically deployed hands, arms, and torsos are presented in the foreground. The dichotomy is fierce and uncompromising. When did you first begin exploring the nuances of this theme? Emma Olswing: I’ve always been drawn to sweetness and femininity of pastels and dusty colors. I began by wanting to explore bodies without context and about a year ago I started drawing a series of hands. The severed body parts I tend to draw are less about gore, more about observing the beauty of a typically under-appreciated body part when it’s removed from the whole. I love discovering the unexpected beauty in things. The tone of the subjects and the pastel colors may seem to oppose each other, but to me my subjects reflect the feminine and beautiful qualities I ascribe to the colors I use. 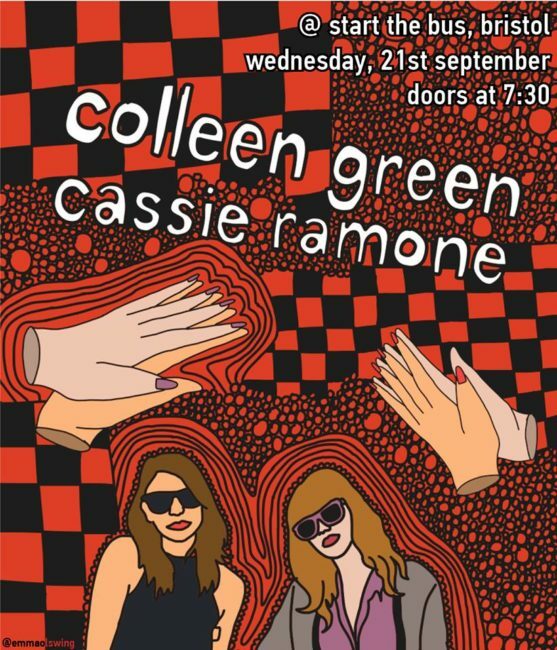 You recently created a tour poster for Cassie Ramone and Colleen Green that initially caught my attention by its use of shapes. How did your collaboration with the two musicians begin, and what was your inspiration for the design? Colleen actually posted on Facebook that she was looking for artists to draw posters for her recent European tour. I emailed her, submitting some of my drawings, and she asked me to do the Bristol, UK poster! She liked the style of a particular self-portrait I drew, which utilized heavy red outlines and checkered patterns in the space around the figure. I took inspiration from that portrait to create the two of Cassie and Colleen and then saw where my mind went with the background. Also, had to throw some hands in there – because it was a sort of signature of mine at the time. With the ease and accessibility of the internet and the channels in which music is heard, there are now more active musicians than ever before. With social media playing an integral part in helping bands stand out, how important do you think show posters, digital or otherwise, have become for artists? I think it’s definitely an integral part of promoting live shows. Whether on Instagram, Facebook, or IRL, a good show poster stands out and gets people interested in attending. It’s also one of the only ways (including album art) that musicians can collaborate with visual artists, which I think is really important for the artistic community as a whole. From tethered to fanned out, you use hands in a myriad of different ways. From an expressionistic and aesthetic standpoint, what about that particular extremity speaks to you? It originally started as a challenge. Hands are notoriously hard to draw and I wanted to push myself to draw something that would take more time and attention. The more I drew though, the more I was drawn to the complexity of hands their ability to convey emotions with the slightest positioning. Everything from how the fingers intertwine to the length of the fingernails makes each hand uniquely expressive. Even in your darkest work, there is a sense of optimism about identity. A reverence for ability and self-respect. How much of a part does the human body and spirit play into your art? It plays a huge role in my work. I am endlessly fascinated by the human body and all that it’s capable of. I also use my art as a way to reconcile with my own body – to show appreciation for it even if I’m not treating it the best I could be. In a social and political climate that is becoming ever more tenuous, how do you see art changing, if at all? Historically, artists have used their art to comment on social/political issues and I don’t see that changing – in fact, with recent political developments I’ve seen an even larger uprising in artists coming together for the sole purpose of activism. Art will always be used as a platform to encourage discussion and to challenge the status quo. You’re both a writer and artist: How do these two mediums coexist, collaborate, and play a part with one another in your everyday life? I actually have always kept my processes separate when it comes to writing and drawing. Writing for me requires much more focus and discipline, as words don’t come as easily to me as swiftly drawn lines do. I think there’s a power in painting a picture solely with words, and that is something I’m constantly trying to improve on. I have been attempting to combine my visual work with written work, but as of now it’s still a challenge for me as an artist. When creating a portrait of yourself or someone else, what’s the most important thing to capture both stylistically and emotionally? This is a question I am constantly asking myself! I recently posted on Instagram, asking my friends and followers to volunteer to be drawn, as I’ve been testing out a new digital drawing style and I felt I needed the practice. With each new friend I sit down a draw, I’m realizing there are so many nuances to capture in a single portrait. I think I’m finding that pose and context (i.e. background, clothing, expression) say the most about someone. I try to add one unique thing to each portrait that I feel represents the essence of someone (whether it’s the particular style of their hair, an accessory, or something in the background). You’re currently working on WINE MOUTH with Franny Lown. What can we expect from this zine and digital archive? WINE MOUTH is a collaboration between writers and visual artists that Franny and I have met throughout the past few years. For the debut issue (available soon! ), we didn’t give the artists any theme or direction, we just wanted to curate a zine full of art that everyone could be proud of. The first issue includes a lot of self-reflection, personal journeys and social commentary that I think will be relatable to a lot of different people. Because we’re so proud of the work that was submitted, and because physical copies of the zine won’t be available to most people (I’m based in SF and Franny currently lives in France), we decided we’re going to publish a sort of digital archive on Instagram (@winemouthzine) to showcase each issue. You can expect a wide array of visual and written work, by young, passionate women artists. In the future, we’ll have themed issues. Also, all proceeds from any physical copies we sell will be donated to Planned Parenthood. Finally, I love how fashion plays a part in your work. Does having a compass for style help in the process of creating contemporary and meaningful art? Thank you! I think fashion plays such a big part in personal and artistic expression. Someone’s style says a lot about them – and just like seeing a person walking down the street in a particular outfit can give you a sense of their inner self, so too does the clothing a subject is wearing in a piece of artwork. Also, there are so many amazing women creative directors, photographers, and designers out there right now so I really enjoy pulling inspiration from the fashion photography and illustration I see in my favorite publications.